The ES2700 is a high performance, non-regenerative DC motor control. Included are many standard features that are available only as options on many other single-phase non-regenerative drives. Accessibility to all important internal regulator points is provided by terminals on the control. This permits the ES2700 to be used in custom engineered applications, as well as in standard speed regulated applications. The ES2700 was designed to control a DC motor's speed or torque by varying the DC voltage applied to the motor's armature. Single phase AC input is converted to variable voltage DC output power by the ES2700. The DC output voltage varies as a function of an input reference voltage in speed regulated applications. Changing the speed reference results in a motor speed change. The DC output current varies as a function of an input reference voltage in torque regulated applications. Changing the torque reference changes the current supplied to the motor and results in a change in motor torque output. The ES2700 is a versatile control. Simple jumpered programming allows the ES2700 to operate from either 120 or 240VAC input power at 50 or 60 Hz. Additional jumpers program the control to operate as either a speed regulator with armature voltage or DC tachometer feedback or as a torque regulator with armature current feedback. Two control models handle the entire 1/4 to 5HP range of application. Calibration of drive current limit and inverse time overload protective circuits for rating within this range is by means of a jumper change in the main printed circuit board. Included in the ES2700 control are many built-in features not available on competitive units. Field economy and separately adjustable rates of acceleration and deceleration are included as standard. If desired, the built-in accel/decel control ramps can be bypassed completely without any change to the control, and current compounding can be added to the speed regulation by changing the position of a jumper. Current limit is normally set by a potentiometer located on the he main printed circuit board, but if desired, it can be adjusted using a remote mounted potentiometer or customer supplied voltage signal. The ES2700 also includes an ammeter output for use with one of the ES2700 ammeter kits. No additional ammeter shunt is required. On occasion, customer requirements may dictate that the operator's devices be mounted on the door of the enclosure. Circuit Board Indicators - Light emitting diodes (LEDs) of the main circuit board indicate: DC overload, Field Loss, Instantaneous Over-current Trip, Run Mode, Jog Mode, SCR's Being Gated. Power Supplies - Each MELLTRONICS 2700 contains and internal 115 VAC power supply to power the DC loop contractor and drive logic relays. Internal ±24 VDC, ±15 VDC and a regulated ±10 VDC power supply are also included. Separately Adjustable Linear Accel/Decel Control - Two ranges: 0.2 - 4 seconds or 2 - 30 seconds. Standard Adjustments - Maximum speed, minimum speed, acceleration time, deceleration time, IR compensation, current limit, jog speed, velocity stability, speed rate and current stability. Jog at Preset Speed - Separately adjustable from zero to plus or minus 50% of base speed. 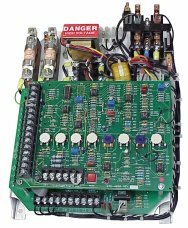 Common Control Circuit Boards - All MELLTRONICS 2700 series controls utilize the same PC board regardless of HP, voltage, frequency, or control mode. Test Meter - this modification consists of a digital panel meter and multi-position selector switch. It provides the capability to monitor nine critical drive parameters. The test meter kit easily connects. Ammeter Kit - the ES2700 control includes circuitry to drive an external ammeter without the addition of an ammeter shunt. This external meter can be calibrated in either percent load or in amperes. Speed Potentiometers - kits includes a high quality industrial grade pot, adjustment knob and associated mounting hardware. Contact SCR Melltronics for details. Voltage regulated: 2-5% of max. speed. Speed regulated: 1% of max. speed with any DC tachometer. Voltage Regulated: Changes up to 15% of topspeed can result from temperature variations, voltage and frequency variations and drift.